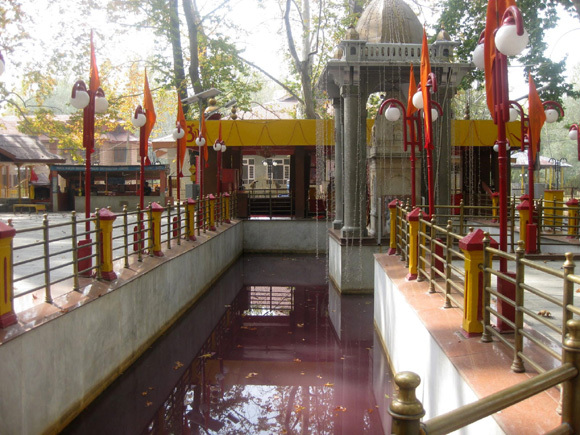 Come Jýeshta Shuklapaksh Aśhtami every year (usually in the month of June) and the Ragnÿa Mata at Tūlamula, also known as Khir Bhawani, beckons one and all to her abode in Kashmir. This was a ritual I remember following right from the days I grew up and it stays with me through my life year after year. Now that I have given up this practice for some time due to the political scene back home our children and grand children are unaware of the happenings related to this event. It becomes difficult sometimes to associate the social and religious significance of this festival to our progeny who have never visited the place and would not comprehend the euphoria it generates in our minds. Busloads of our Biradri arrived early morning at Tūlamula carrying with them the ritualistic offerings that included Kānd, Flowers, Milk and “vĕn”- a herb, that would be offered to the deity. Some would buy these offerings at the site itself from vendors of the local Muslim community who participated enthusiastically in our rituals. People carried with them their lunch for the day that mostly comprised of “Chāman”, “Dămalu”, “Häk” and boiled rice. The family enjoyed this gathering at Tūlamula and after Puĵa bought locally prepared “Lŭchha” and “Hälwa” and took it away with them as Prasäd. Relatives met there at the occasion and greeted each other leaving out all bad vibes, if any. Those who stayed behind used to participate in the “Aärti” at night and later take rest in the night shelters provided by the “asthãpan”. It was not only the busloads of people that arrived at Tūlamula, some adventurous guys foot the entire distance of 14 Kös, about 28 miles, and there were people who arrived there by boat all the way from Srinagar. The spring of 1955 was ever so bright and its events are etched in my memory in a kaleidoscope of colors that I want to share with you like a child would his toys that have just been delivered to him on his Birthday. It was a Sunday and a huge House Boat lay anchored in the canal running along our house at Jogi Lanker, Rainawari. 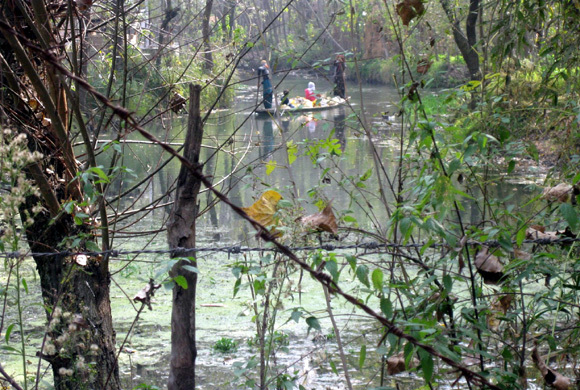 The canal in fact is an offshoot of the Dal Lake that surrounds Jogi Lanker making it some kind of an island with bridges that connect it to the rest of Rainawari. The House Boat was loaded with all our necessary stuff of food, clothing, cooking pots and even games for the children so that they do not get bored on the journey that would take almost three days for the outward journey and two days inward. That was because the outward journey required navigation upstream and the return was a downstream glide. At night the boat used to halt close to the river bank and it was moored there for our convenience. The Dal Lake connects with Jhelum River at Dálgate that allows the water traffic to be regulated by leveling out the water between the Dal Lake and River Jhelum (both being at different levels) through sluice gates and then releasing the traffic once the water levels even out on the other side. The feeling of being trapped in the enclosure at Dalgate is wonderful and this leaves the mind of a child awestruck at the ingenuity of man. 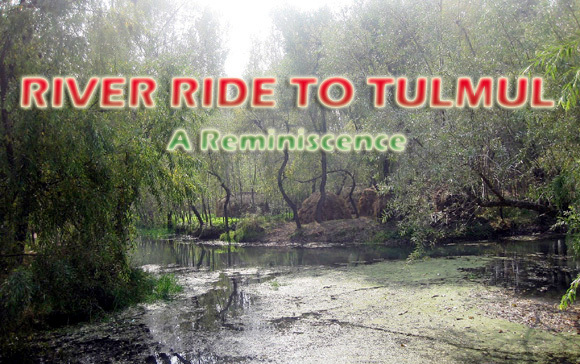 The waters of the Jhelum River take you through the Chhattabal Weir towards “Shadipöra” where this river meets with the Sindh River that ultimately takes you to Ganderbal leading on to Tūlamula where the Mata Ragnÿa temple is located. What a sight it is to watch the muddy yellow waters of Jhelum meet the Milky white waters of River Sindh. My Grandfather was a pious and saintly man and his attire a beautiful combination of a light brown long coat with a “band gälla” and a churidar pajama with a kêsri or blue color turban that gave him the look of a wise man, and by all means he was wise and learned. He always carried a cane that added to his grace. My Grandma had passed away even before I was born and for my Grandpa his family was the pride of his life. He adored the grand children from his three sons, 10 on the count on that day, and fulfilled all our desires and told us stories of Kings, Queens and Countries where we traveled in our imagination. His teachings of our religion were tuned-in with stories to make it easy for us to understand the significance of it in a beautifully crafted manner. But it was my father who was very good at telling stories of Ramayana and Mahabharta and also of angels and saints. Soon our parents got busy making the journey worth remembering and the entire houseboat turned to be our home for almost seven days it took us for the trip. Tired after the pull at the boat we would sit out by the riverbank and soon our mothers bought us some hot sizzling “Paköras” that we immensely enjoyed. The same exercise was repeated the next day on the second leg of the journey. We somehow felt bad when the boatman called for no such effort on our return journey as the boat glided on its own with a little push at the oars. But I do remember I had a try at the long pole that required to be embedded on the river floor and then a push applied to move the boat with the resultant force. That was fun and an occasion to showcase your muscles and biceps that were shaping up at that age. The togetherness of the family and living in close proximity with each other is something that promotes bonding and an emotional attachment that lasts a lifetime. During the progress of our boat ride we were not surprised to find a couple of more boats on a similar voyage carrying two other families who were enjoying the trip equally with their kids meeting us all the way in our fun and frolic. In fact we were pleased to establish a bonding with those kids that lasted a long time. As we closed in towards our destination we had one last stop at “Döderhoma” where we replenished our stock of milk and fresh vegetables. It was here we met a middle-aged couple on a pilgrimage on foot all the way from Srinagar. They had to take a boat ride at Döderhoma to the other side to be able to continue with their journey and there were boats and boatmen ready to do that for a fee. Now there is a bridge there to cross over. My father happened to know them and offered them a ride on our boat and they graciously accepted and accompanied us all the way to Tūlamula. A couple of years later, I remember, we kids also performed the pilgrimage on foot and this time also we were led by our Grandpa and the journey took just a day to reach the temple rather than three by boat. Though the significance was the same the ambience was different and we do remember our river crossing at Döderhoma. It is a feeling of rejoices when you are in the temple premises at Tūlamula. The temple of Ma Ragnÿa is inside a pond that is hexagonally shaped and a pooĵa space in front that is appropriately decorated. The water in the pond assumes any color ranging from blue to light green to milky or pink or crimson reflecting the mood of the Ma on a particular day. It could be black if Ma is displeased and wants to show unfolding of unfortunate events. Chinar trees abound in the huge compound, the floor of which is laid with stone that has withstood the vagaries of time. A stream from the Sindh River flows nearby and devotees take a bath there before entering the main sanctum sanctorum of the temple. Special arrangements are made for the ladies to take a dip. After washing, you approach the “prasad” makers who arrange a “pooĵa thali” so that you could perform the “pooĵa” at the main temple. And it is only later that you eagerly order for your “Lûcha” and “Hälwa” and take home a happy feeling of having prayed to Ma Ragnÿa. We stayed on at Tūlamula for two days housed in our own boat for the night and during this time we must have invited a dozen of our relatives we met there to participate in our celebrations and share food with us. Our parents were known around by almost everybody and our Grandpa was the star host who invited everyone in to show them his love and shower blessings. All of us roamed around in the village close by and played games with many whom we did not even know. All in all the feeling was just great. Our boat ride back home was a peaceful event with all of us joining in a chorus singing the songs in praise of Ma Ragnÿa and that too in a loud voice so that the people living along the river shores were mesmerized with the tunes. The night was spent at Shadipöra on our return and my grandfather performed some “puĵa” there for our ancestors just like he did on our outward journey. B.L. 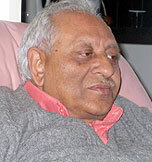 Dhar was born and brought up at Srinagar. He did his Master's Degree in Mathematics. For work he joined the Civil Aviation Department as a Gazzetted Officer and later shifted to a PSU, Airports Authority Of India from where he retired as a General Manager in the year 2000. Since his retirement he has been writing articles and stories, some of which have appeared in Shehjar on a regular basis. He claims he loves writing right from his college days, but majored in Mathematics instead of English only as a challenge to his talent. He lives in Delhi with his wife, the children having moved over to the USA for work.